How to calculate the battery runtime? Whether you're trying to figure out how long will a battery in your brand new laptop last, or what will the runtime of your DIY electronic device be, look no further than this battery life calculator. It gives you a realistic approximation of the battery runtime basing on its capacity and the energy consumption of your device. You can use this battery calculator in two ways. The default mode assumes that the battery runs continuously until it is discharged. If you open the advanced settings, you can analyze what happens if your device switches to a sleep mode. Capacity is the capacity of your battery, measured in ampere hours. You can usually find this value printed on your battery. Discharge safety is the percentage of your battery capacity that is never used. For example, if you use a LiPo battery to fly a drone, you should never discharge it below 20% - otherwise, it can be damaged. 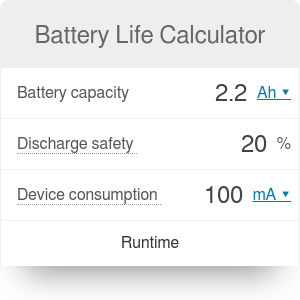 Our battery life calculator assumes a default discharge safety of 20%, but feel free to change it as you wish. Now, let's imagine you are building an IoT device that spends most of the time in a sleep mode. You'll probably want to calculate how long will a battery last in such a case. All you have to do is open the advanced mode to find out! Awake time is simply the time that your device is not sleeping during one operational cycle - for example, 2 seconds. Consumption in sleep mode is the average consumption of your device in sleep mode, measured in amperes. This value is probably much lower than the consumption in awake mode. Sleep time is the time that your device spends sleeping during one operation cycle. where index 1 describes the awake mode, and index 2 the sleep mode. After determining the average consumption, our calculator substitutes for into the regular battery life formula to figure out the runtime of your battery. Battery Life Calculator can be embedded on your website to enrich the content you wrote and make it easier for your visitors to understand your message.